Société Nationale Industrielle et Minière (SNIM), Africa’s second largest producer of iron ore, operates a mine in Zouerate and exports the ore from the port of Nouadhibou, Mauritania, in Western Africa. The facility is powered by a 16 MW diesel plant equipped with 4 diesel gensets, feeding a 5.5 kV grid. Consumers are essentially motors for ore conveyors and crushers. 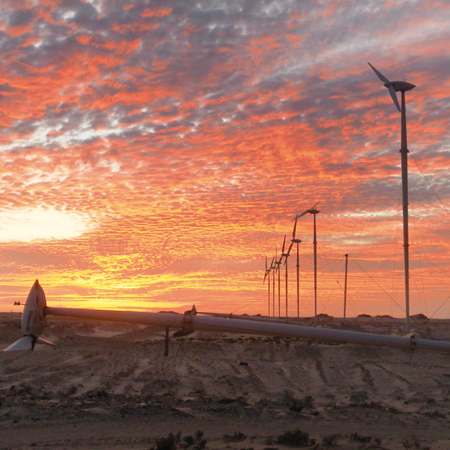 Considering the powerful wind potential of the Nouadhibou site (8.78m/s at hub height), SNIM decided to diversify onsite power generation through the development and installation of a wind farm. Specific wind turbine technology was also required to address the near-shore location, very dry and warm climate, and highly corrosive environment. With Hybrid Wizard® at the core of his proposal, Vergnet not only fully complied with client’s specifications but also allowed optimization of wind power production with existing diesel power production to maximize fuel savings. For all installations, Hybrid Wizard™ implements single outage contingency (N-1) for generating units. A full study was performed to assess and guarantee the achievable wind power penetration according to wind profile, grid load cycles and diesel gensets characteristics, while preserving safety and security of goods and persons, availability of the grid and power quality. Electricity demand has been growing at an average of 10% since 2000 mainly due to mining and other industrial operations. Electricity production in Mauritania are mainly of thermal origin, with a strategic plan in progress to diversity the mix (to reach 20% of renewables by 2020). SNIM is the second largest producer of electricity in the country after SOMELEC, producing electricity to satisfy mining activities in Zouarate and Nouadhibou. The 4.4 MW wind project by SNIM clearly appreciated as commendable efforts to diversity the energy mix.